How do you handle a historic 6-0 defeat against a direct rival in the Premier League as a head coach? 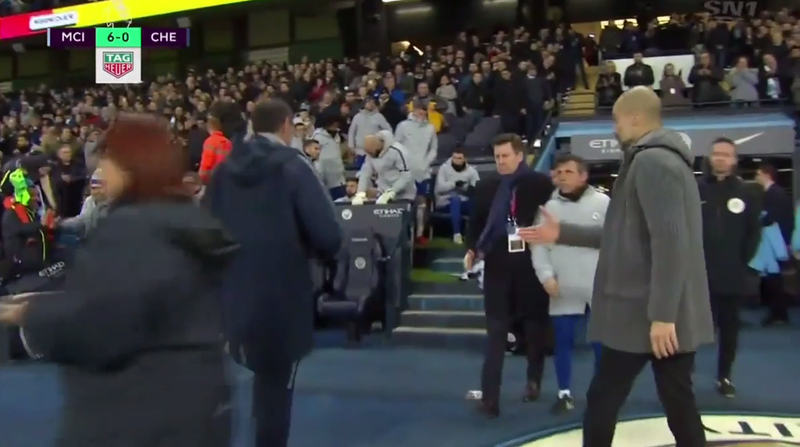 Maurizio Sarri’s was to immediately leave the bench for the dressing room and in doing so, he missed Pep Guardiola’s handshake gesture. Sergio Aguero’s hattrick coupled with Raheem Sterling’s brace gave Manchester City a massive 6-0 win over Chelsea on Sunday. The Blues knew they had a tough job on their hands last weekend, but may have underestimated the zeal and ambition of the Citizens. Guardiola was eager to maintain the lead on Liverpool and proved why his side were deserving of the champions tag and they did so perfectly. The Catalan had extended his hand right after the blast of the final whistle but Sarri walked right past him leaving Pep stunned for a moment. It is perhaps in the spur of the moment and the frustration may be a reason but the Italian suggests he didn’t even notice the former Barcelona manager.